South Dakota: When Walt Pourier was growing up in Pine Ridge, he would skateboard on a hill. Pourier is now 46 and thanks to his efforts, Pine Ridge skateboarders can ride more than a hill. 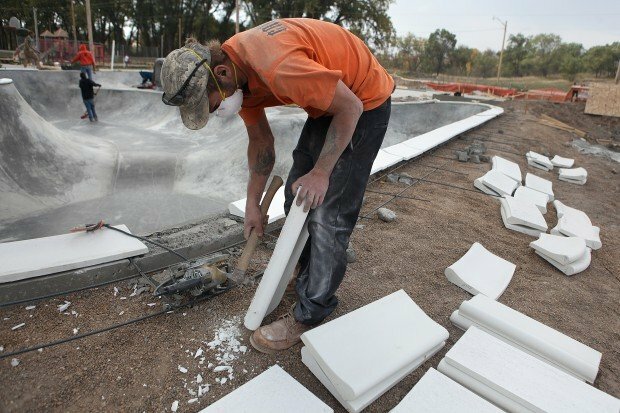 A littered patch of dirt has been transformed into a skate park that's among the largest in South Dakota. Pourier describes the skatepark as a clover with three bowls ranging from 6 to 13 feet across. Pourier's organization, the Stronghold Society, raised $55,000 for the park. It was built by Grindline Skateparks. Workers donated their time and lived in campers. People around Pine Ridge helped build the park and feed the workers. Thanks to those many volunteers, the finished skating area looks like it cost closer to $200,000. "The community's so stoked on this that everybody's been doing their part," Pourier said. "It's a grand idea, and you feed that grand idea - that's part of the strategy of this." The new skateboard park is called "Wounded Knee Four Directions Toby Eagle Bull Memorial Skate Park." It's named in honor of Toby Eagle Bull, a 20-year-old Pine Ridge resident who died in a car collision in 2002. Eagle Bull was a skateboarding role model who started the skateboarding interest in Pine Ridge. Park funding came from several sources including Jeff Ament, bass guitarist for Pearl Jam, Steve Van Doren from Vans brand shoes, and the Tony Hawk Foundation. Two THF board members were so impressed by the plan that each made $5,000 personal donations on top of the foundation's $10,000 grant. That's a first for the organization. The park should give children and teens something positive to think about, Pourier said. Besides high rates of youth arrests, drug use, and dropping out of school, nearly 100 reservation youth people attempted suicide from 2008-2009. "We really don't say, ‘suicide,' ‘suicide,' ‘suicide,'" Pourier said. "We say, ‘live life,' ‘live life,' ‘live life.' And that's how we want to inspire these kids. It's kind of changing a mindset. It's bigger than just building skate parks." This is the second grant the Tony Hawk foundation has given to the Pine Ridge rez. The first was granted in 2003 for the skate park at the Boys and Girls Club in Pine Ridge near the Nebraska border. Twenty-four-year-old Jordan Big Crow teaches skateboarding at the Boys and Girls Club. Their park is in good condition and children skate on it all the time. Jorday says the new skate park will be "amazing." "It's the safest place to skate. We have rules to go by, and it's just out of gang reach - it's not even graffitied," he said. "All the skaters here, not one of them is in a gang. And you can't say that about any other activity that's around here." This is the first skate park Pourier's planned for the reservation. He also wants to build at Wounded Knee, Kyle and Thunder Valley, then expand to other reservations. "People tend to paint them as dark, but that's a stereotype. These kids are the opposite of that," he said. "These movements are the call to humanity of today. We want to create movements like this. We want them to be kind of rebellious of these stereotypes. We want them to show people who they are."